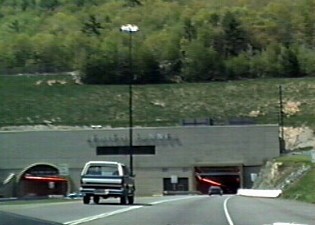 Located just south of the Stroudsburg Exit at US 209 (Exit 74) on the Pennsylvania Turnpike, the Lehigh Tunnel is the only Turnpike tunnel in Eastern Pennsylvania. 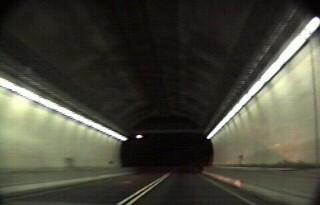 Traveling below Blue Mountain to the north of the Allentown/Bethlehem area, the tunnel facilitates four lanes of travel between Philadelphia to the south and Scranton/Wilkes-Barre to the north. 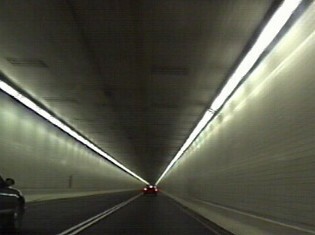 Originally the Lehigh Tunnel consisted of the northbound only tube. 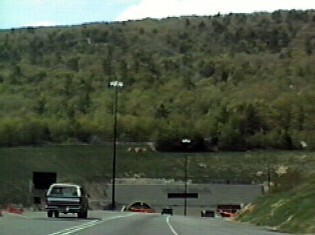 While this was sufficient in the early years of the Turnpike, increasing traffic demands and tourism in northeast Pennsylvania caused the Lehigh Tunnel to become a chokepoint, with traffic reducing from four to two lanes. After many years of this condition and associated headaches, it was agreed to double the capacity with the construction of a new southbound only tube, with the original tube serving northbound. 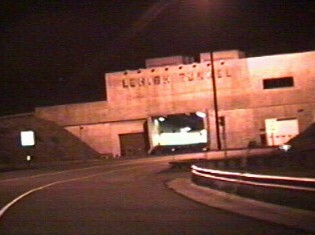 The project began on February 14, 1989 and was completed in November 1991. 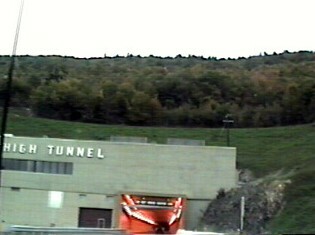 The southbound facade shows the difference in age between the two entrances. 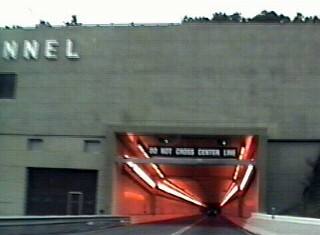 Notice also that the "Lehigh Tunnel" letters are still centered over the original tube to the left. 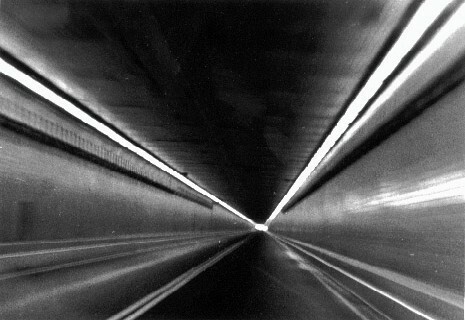 Another perspective of the northbound tube, photographed by Doug Kerr in 1999. 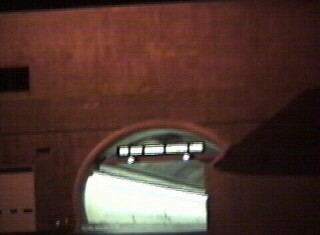 The southbound tube is tiled on the sides, but not on the ceiling. 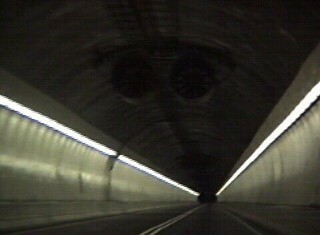 Large ventilation fans are in place throughout the length of the tunnel. 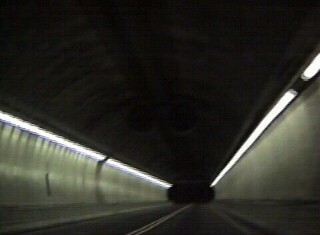 Also interesting how the newer tunnel is more circular in design. 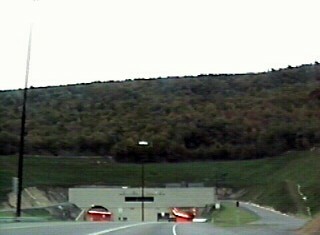 Entrance to the tunnel along southbound I-476. All southbound vidcaps taken September 13, 1993. Page updated August 20, 2004. Content and graphics copyright © Alex Nitzman. All rights reserved. 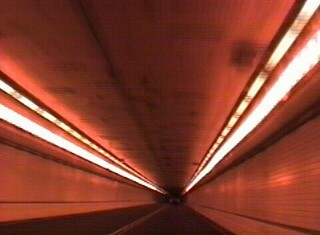 Page courtesy of Alex Nitzman who originally produced the page and took the pictures of the tunnel.